Taking a cue from software companies, Dynafit is now appending version numbers to its bindings. We recommend upgrading to the latest version of the Radical ST if it’s compatible with your operating system. The recommendation is due to release and retention improvements that move the tech binding a step closer to its alpine brethren. With 10mm of spring-loaded heel travel and a toe that pivots laterally, the 2.0 has a smoother release while being more resistant to pre-release. In fact, the binding is now DIN certified. Borrowed from the innovative Beast binding, the pivoting toe works in conjunction with the rotating heel to provide more reliable lateral release. The design also enables the absorption of side impacts without pre-releasing, since the boot can be displaced several millimeters and still return to center, much like an alpine binding. In addition, the spring loaded heel piece shifts backwards as the ski flexes, which helps the binding maintain its release characteristics under heavy load. This extra elasticity makes the 2.0 a better crossover resort binding than the Radical ST. In addition, the binding appears to be dipped in gold to make it a better hedge against inflation. Newly certified by TÜV to the DIN specification for binding retention and release. Radical climbing flaps let you choose from two riser heights in addition to a flat-on-ski option. Proven Dynafit Radical toe lock lets you select between unlocked ski and locked uphill modes. 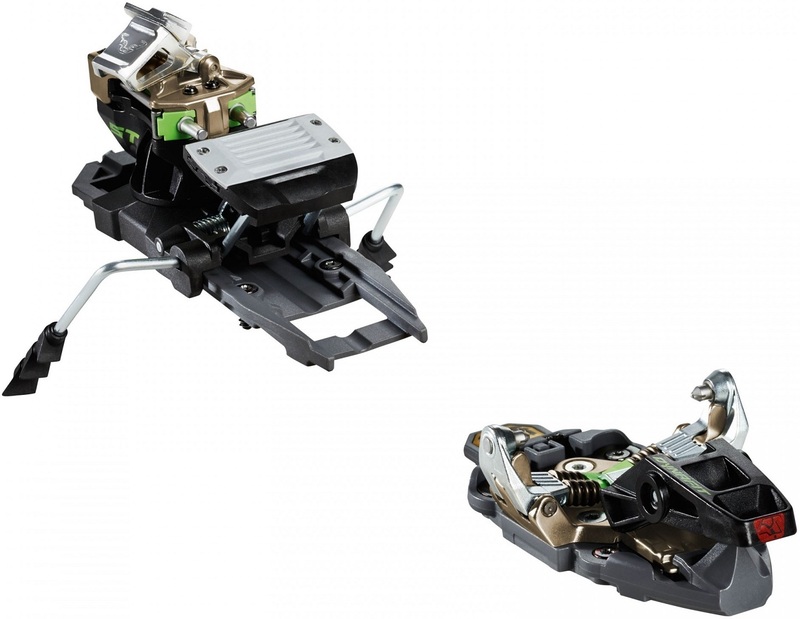 New wider baseplates and mounting pattern allow for greater power transfer to the ski. Reduced heel pin height puts your closer to the ski and normalizes unnatural ramp angle. Forged aluminum roof on the heel piece is stronger and attached more securely to the housing. Heel pieces slide backward up to 10mm to maintain consistent release while the ski is flexed. Toe piece pivots laterally to work in conjunction with the rotating heel to provide a smooth release. The binding can absorb sideways impact forces and still return to center due to the pivoting toe. The primary difference between the ST 2.0 and the 1.0 is the addition of a rotational mechanism under the toe piece. This works in conjunction with the heel piece to provide smoother lateral releases while being more resistant to pre-release due to side impacts. There is also a new screw-hole pattern and larger base plates to spread power across a wider area. Slightly lowered heel pins, stronger climbing plates, and a shiny gold coating complete the checklist of differences. The 2.0 versions of the Radical ST & FT mirror the differences found in the original versions. For starters, the FT versions have stronger heel springs, increasing the maximum release value to 12 versus 10 on the ST models. In addition, the FT 2.0 features wider baseplates made of aluminum for better stability and power transfer than the plastic ST plates. Those changes come at a cost of $100 and approximately 35 grams. I’m on my third season of a pair of Radical 2 STs that I swap between three sets of skis with inserts. Probably around 150 days on my set, almost all touring but maybe 10 or so days I’ve used them inbounds. I would recommend them with a few points to keep in mind. The first would be when touring in powder is to make sure you clear snow from under the stomp pad. I had the pins between the stomp pad and spring controlling the brakes break once when I had too much snow built up and I stomped down to lock the brakes (replaced under warranty by Dynafit but I had to wait for the replacement part). Also I had a lateral pre-release or two from the heel spinning so I had to increase that release setting, but it is independent of the vertical release setting. Overall I would not hesitate to recommend them, and if they need replacement I’ll either get another set or get the Rotations. Hi I have a the atomic back hands. Will the 120mm brakes be okay? Hey Duncan! I'm assuming this is the Backland 95, correct? If so, they're a bit wider than would be ideal and you may bash the brakes together while skinning and they may also snag on the snow if you get into a really deep carve or do any steep skiing on firm snow. I've also had friends catch oversized brakes on their pant cuffs if they have holes in them, which sounds terrifying at any speed. The 105mm brake would be ideal (even the 90mm might work actually), though it looks like we are out of those at the moment but do have some Radical 2.0 FT with the 105mm brakes in stock. If you're not a fan of the release values on the FT, I have the new and updated Dynafit ST Rotation 10 with a 105mm brake in stock as well. Do these have a din setting? Would this be a good binding if I wiegh 145 pounds, female, 5'4? I am looking for a binding for the Salomon Explore 88 or could I put my Marker King Pins on them? I have La Sportiva Sparkle boots. Hi Sara, these could be a very good binding for you. While they don't have a "DIN" setting, they do release and have value adjustment similar to alpine bindings with a "DIN" standard adjustment. At your size, you likely need a release value somewhere between 4.5 and 9.5 and these bindings can easily accommodate that for you. Would the 105 work on the Voile Supercharger, which is 106 underfoot? Hi Bob, yes you have a little wiggle room so those should deploy just fine. What brake width would you suggest I go for to fit on Volkl Nanuqs (96mm at the waist)? Is that too big to get the 90s over? Hi Willancs, it'll be close! You may need to grind down the plastic ends for it to deploy cleanly. What brake width would you reccomend on the DPS Cassiar 95? Will the 90s likely clear the waist, or do I need to size all the way up to 105? Thanks! Hi Mike, the 90s will clear with a nicely centered mount. I've been using the Radical ST 2's on my inbounds and backcountry skis: 30 days this winter. I've been very happy with them. No real pre-releases to speak of - even with plenty of ski patrol work with heavy toboggans (with heavier people loaded) down steep runs. And i'm a bigger guy to begin with (210 lbs). Of the few wrecks i've had where they needed to release they did. On the tour side of things ... 100%. No releases, no problems with ice, no problems with brakes ... super solid. I'd recommend these bindings to anyone. What brake width would i want with a BD Carbon Convert? Thanks! Hi biggb, you want the 105s, which are slightly wider than advertised to accommodate the extra width near the toe piece on a typical shaped ski.